Beaches in Okinawa are brilliantly white, and the water is clear and emerald green due to the coral reefs. They are so beautiful. We are good at connecting people! We are a wellness/health tourism facilitator focusing information on Okinawa's wellness/health services. Being good at connecting people, you and your wellness/health care providers, we offer a full range of services for your trip to Okinawa. The Okinawa archipelago, made up of 160 islands, 49 of them populated between Kyushu and Taiwan, offers tropical beaches, crystal clear blue waters, and one of the best diving sites in the world. You cannot find any other beautiful blue waters and smooth white sands than those in Okinawa. Every beach instantly washes your worries away, and you could spend hours,not knowing how much time has gone by. Some beaches on Ishigaki Island, Okinawa feature a rare type of star-shaped sand. When you find tiny ones, you will feel wonderful. But, someone said, "Because I got knee problems, pain in my knee after getting up and down makes me not to move unless it is necessary. I know having knee pain does not mean to the end of my physically activity. My doctor told me that exercise can help strengthen muscles, keep bones strong, and improve joint mobility. It certainly not only improve my physical function but also helps boosting my quality of life. I know it, but I simply can’t do it." Ryukyu Resource will help you adopt lifestyle changes that can enhance your health and wellness. Please let us know what problems you have. We will listen to you and get answers to your questions. Read more on About Us. Thalassotherapy, a therapeutic application of sea water and marine products like algae and mud, was founded in France in the early 1900s. There are many thalassotherapy facilities available in the world today, but most of them in France and other European nations. Since seawater and human plasma are very similar, human body easily absorbs the minerals its needs through the skin when immersed in warm seawater and wrapped in seaweed, mud, and clay. You can just get thalassotherapy benefits by walking on the beach and breathing the sea air. Repeated exposer to these helps to restore the body's natural chemical balance. Thalassotherapy is popular and good for people with arthritis, osteoarthritis, rheumatoid, and stiff sore muscles and joints will all benefit from seaweed therapy. Read more on Services. Secrets of Longevity: Come to Okinawa and Find Them! People of Okinawa have found out a secret recipe for living to be 100 years or more. It isn't just something there in Okinawa. Okinawans have learned that healthy diet and lifestyle are the most important factor in determining how long and how good they live. But, younger Okinawans move away from home and go in for the western diet and lifestyle, especially sons of healthy parents don’t enjoy their long healthy lives any more. One generation starting a bad habit has significantly surged cancer, stroke, and heart attack to shorten their life-spans. Nowadays, we all know that the key to good health is healthy lifestyle,　namely physical activity, balanced diet, and good sleep. But sticking to the good recipe is not easy. Everyone experiences barriers that prevent them from following the traditional ways of living. Understanding your barriers and learning how to overcome them is essential. Coming to Okinawa and finding out how elderly Okinawans do to make them healthy, you will understand you better. 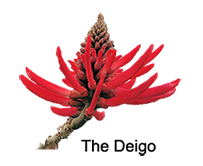 The Deigo, a flowering tree, originally from India blooms bright red flowers in the end of winter and the coming of spring. It is a symbol of good fortune, and prosperity. But, when it exceptionally blooms in a particular spring, there come strong typhoons or misfortune. It is said that the spring of 1945 saw one of the fullest blooms in living memory, just before the beginning of the battle of Okinawa which would devastate the island. 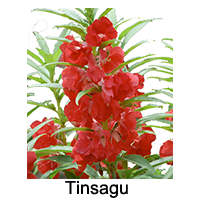 Tinsagu is the local name of balsam impatiens. There is an Okinawa folk song, named for the balsam flowers. Okinawans love this song because its lyrics written in local dialects have a profound meaning. The lyrics not only teach children to listen the wisdom of their parents and ancestors but also capture their heart. When you hear this song by chance, its melody will sure to capture your ear even if you don't understand the meaning. 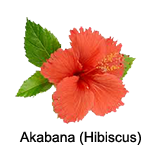 Akabana (Hibiscus) literally means red flowers. They are just lovely. Hibiscus can add beauty to a garden. Not only that. Hibiscus is a tree with high wind tolerance. Since there hit many typhoons in Okinawa, Hibiscus makes beautiful hedge for a natural hurricane wind screen. In Okinawa, Hibiscus blooms all the year around. In the morning, it has one bright red flower in full bloom, but at the end of the same day, it is black around the edges and wilting. A hibiscus flower will appear and last for only one day. While each bloom only lasts for one day, the tree produces one after another. Hibiscus floor is so short-lived. Some people see it fragility of life and call it “Gusobana (flower of the afterworld)” planted in graves and cemeteries in Okinawa. If you have any questions or more details, please feel free to contact us.© Copyright 2013 Ryukyu Resource, Inc.